Sapporo (Japan) – December 19, 2017 (travelindex) – Best Western Hotels & Resorts has unveiled Best Western Sapporo Odori-Koen, an exciting new midscale hotel in the center of northern Japan’s largest city. Nestled in the heart of Sapporo’s Chuo-ku, or “central ward”, the hotel is surrounded by shops, leisure attractions, offices, and opposite the popular Odori Park. 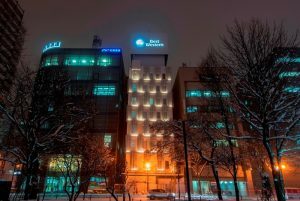 This makes Best Western Sapporo Odori-Koen the ideal choice for all types of visitor to the city, including those wishing to experience the magic of the annual Sapporo Snow Festival, which attracts more than two million people to Odori Park each year. Next year’s event will be held between February 5th and 12th, 2018. Officially opening in the first quarter of 2018, Best Western Sapporo Odori-Koen features 60 comfortable and contemporary rooms, all equipped with cutting-edge facilities, spacious working areas and complimentary Wi-Fi. “Sapporo is one of Japan’s largest cities and the gateway to the island of Hokkaido, so we are delighted to be able to cater to travelers in this vibrant city,” Olivier Berrivin, Best Western Hotels & Resorts’ Managing Director of International Operations – Asia. “This opening marks Best Western’s return to Sapporo, as we continue to expand in Japan’s most popular destinations. With 15 hotels now either operating or under development across the country, Best Western is confirming its position as one of Japan’s leading international hotel groups,” Olivier added. Best Western Sapporo Odori-Koen is located just 600 meters from JR Sapporo Station and approximately one hour’s drive from Sapporo’s New Chitose Airport, which provides direct connections to and from major cities all across Asia and beyond. It is also less than two hours from the famous ski slopes and year-round outdoor activities of Niseko. This new hotel is the latest in a series of exciting developments for Best Western in Japan. Earlier this year, Best Western Tokyo Nishikasai Grande became the company’s third property in Japan’s capital city, and the rebranding of The Hotel Nagasaki marked the launch of Asia’s first operating BW Premier Collection® hotel. Best Western Osaka Tsukamoto recently opened in Japan’s second largest city, and Best Western Yamagata Airport welcomed its first guests in October 2017.